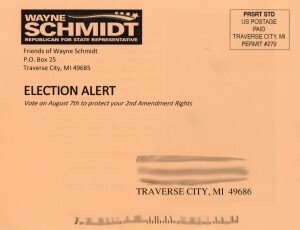 Typically at this time the Wayne Schmidt ‘hunters orange’ mailers will go out claiming that a vote for his primary challenger is an anti-gun vote. I have been on the challenger side of this event with Schmidt before, and am familiar with the strategy. It was a nutty ruse that worked. 2A supporters are very serious, yet so many don’t really have time to know everything about the candidates.I have never been identified as anything but pro 2A and far more so than most elected types. Even Larry Inman lost the coveted NRA endorsement to me in 2016, but because his campaign manager’s family ran the print shop where the NRA printed and mailed their endorsement mailers supporting my candidacy, THAT potential threat to the incumbent was neutralized by a timely follow up with his own orange (pro gun) mailer to the exact mailing list. He is certainly not a pro 2A crusader. He is not going to be the guy who falls on that sword to preserve our constitutionally protected rights. He is not the one who is likely to keep moving the window of opportunity for gun owners with regard to constitutional carry, and guaranteed protections. As ardent supporters of gun rights, you and I know that these words from the Second Amendment are absolutely critical to a free society. And with the 2018 primary season heating up in Michigan, every politician will be claiming their support for the Second Amendment as they attempt to earn your support. Yet many of these politicians are always seemingly champing at the bit to do whatever they can to restrict your freedoms in a “common sense” way. That’s why I sent the Great Lakes Gun Rights Candidate Survey to candidates running for office all across Michigan – to get them on the record in support of our gun rights. And I’ve got good news and bad news for you in House District 37. The good news is that Republican candidate Jim Gurr answered his Candidate Survey 100% pro-gun. In returning his survey, Jim Gurr is pledging his support for solid pro-gun “Constitutional Carry” legislation. Constitutional Carry is the landmark legislation that would allow law-abiding Michiganders to carry their firearm — open or concealed -– without begging the government for permission and paying an expensive fee. As every gun owner knows, these dangerous laws only disarm law-abiding citizens while letting criminals know that their victims will be disarmed in these areas. Finally, Jim Gurr also pledged to help repeal Michigan’s draconian “permit to purchase” scheme, which is unconstitutional and a de facto form of handgun registration. But there is also bad news for Senate District 37. State Senator Wayne Schmidt is REFUSING to return his Candidate Survey. By refusing to return his survey, Schmidt is refusing to go on record against the draconian “permit to purchase” law in Michigan, which is unconstitutional and serves as a de facto handgun registration scheme. He also refusing to go on record opposing “gun-free” “criminal-safe” zones where armed thugs can be assured their victims are unarmed. Schmidt is refusing to go on record supporting your right to legally “Stand Your Ground” and defend yourself and your family against armed thugs in the street. This is disturbing behavior for a sitting Republican Senator. In the wake of recent tragedies like the one in Parkland, Florida, anti-gun politicians are chomping at the bit to punish law-abiding citizens for the actions of pure evil. So when candidates try to keep their stance on the Second Amendment secret, it’s usually a very telling sign that they’re up to no good. And when politicians refuse to take a stand in support of the Second Amendment, you can be almost certain that the rest of your Constitutional rights are not on their list of priorities, either. That’s why Great Lake Gun Rights is dedicated to keeping constituents informed about the true positions of our elected officials and candidates. With members and supporters across the state, we are giving Michigan gun owners a loud voice in defense of our gun rights. And trust me, the politicians can hear you. There is no better time to lobby them than when they are seeking your support at election time. So please contact Senator Wayne Schmidt at (231) 883-3737 to ask him to start standing firm for your Second Amendment rights by returning their Great Lakes Gun Rights survey! Then contact Jim Gurr at (231) 709-0474 and encourage him to continue standing firm for your right to keep and bear arms. After that, please consider chipping in $35 or $15 to help us fund our 2018 Primary Election Accountability Plan! With our rights at stake, now is the time to take action! P.S. The August 7th Primary Election is just around the corner and now is the best time to lobby your local candidates. Unfortunately, State Senator Wayne Schmidt is REFUSING to return his Candidate Survey. In the wake of recent tragedies like the one in Parkland, Florida, anti-gun politicians are champing at the bit to punish law-abiding citizens for the actions of pure evil. So please contact Senator Wayne Schmidt at (231) 883-3737 to urge him to start standing firm for your Second Amendment rights by returning his Great Lakes Gun Rights survey! Yeah.. its a fund raising letter as well, but it serves a valuable purpose. 2A Rights are kind of a big deal, yes? Then there's Wayne Schmidt being on the foreground of the gas tax WITH AN INFLATION CLAUSE in it. He then justified his disenfranchising 80% of NO Voters (with this legislation) by saying "they just don't understand" Well YOU are THEY and Wayne thinks he smarter than you. Translated, Wayne is smarter than 80% of state-wide voters. And, assholes actually re-elected him?